The quintessential storyteller is fascinated by American quilts, saying it's not so much a story as a question. Who made this? 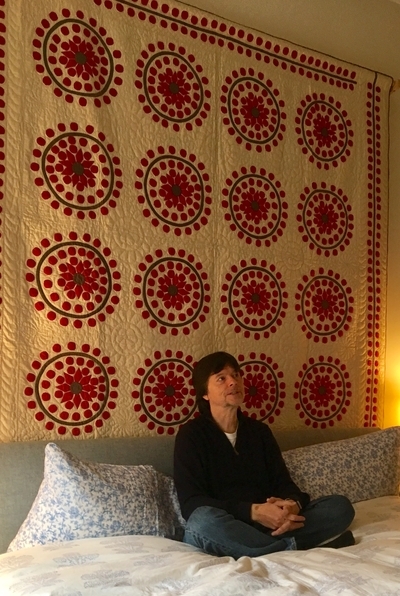 This week, the International Quilt Study Center & Museum in Lincoln, Neb., will reveal a surprising side of the prolific filmmaker Ken Burns: He collects quilts. The exhibition "Uncovered: The Ken Burns Collection" will display 28 of them for the first time. Mr. Burns has been buying American quilts since the mid-1970s, often on prowls through antique stores on the back roads of New England; before too long, dealers began coming to him. He now owns about 75 quilts, split among his home, office, barn and lake house in New Hampshire. He also keeps three in his Manhattan apartment, including his favorite, the "Circular Wreath" quilt, which hangs above his bed. He did not tell the International Quilt Study Center about it, he admitted. "I don't have a quilt that gives me more pleasure than this one." He warmed to his subject. "First of all, you're faced with a loud but controlled design of these circles and these spots and these dots and the borders. And then," he said, pointing at the white background, "you go in and you cannot believe the extent of the quilting. There's some mirrored or deeper round circular things that aren't in any way what the circles are, and there's combinations. One may be a pinwheel, followed by something that is more like a traditional flower, with blossoms, and then lots of leaves in between. If you consider the thousands of woman-hours that went into this, it's just an extraordinary thing." "I would not trade it for a $25 million painting by you-name-the-artist," he added. What draws you to quilts? .A quilt greets you on many levels. It has its stunning initial design, and that draws you into it — established patterns like a crazy quilt or a log cabin quilt. I'm less interested in that than in just how beautifully they've realized that. Then others seem to have sprung from the imagination of the creators, or they are riffing on a design and have gone so far away that they've just added something new. And then, once you've accepted the symmetry or the asymmetry, the colors and the patterns, then you go in to see the minute quilting itself. How do you decide which quilts to buy? It's completely visceral. I can tell in a nanosecond whether I want to put it into the maybe pile or the yes pile or the no pile; and then the maybes, it takes me only a few more seconds of reconsideration to say yes or no to them. The center says that quilt collecting is an extension of your "passion for storytelling." How? They're an essential building block of the culture that's making them. Women working with fabrics produce something reflective of it. I collect American quilts and they tell me a lot about the country. Sometimes these are collective affairs, and that's a wonderful thing, because the story of us, both the pronoun and U.S. "us," is a tension between individual and collective freedom — what I want and what we need. It's the essential conflict, and to me quilts reconcile that. What stories do quilts tell? We see quilts in an anachronistic fashion — they are quaint. They're of a different era. And yet I possess, and the Nebraska show is exhibiting, a quilt by the Amish that we estimate comes from the 1830s, which is 100 years in advance of some of the modernist geometric designs of Piet Mondrian, who we think of as the epitome of modernism. Here these Amish women in central Pennsylvania were doing something 100 years before Mondrian. I like that — it's not so much a story as a question. Who are these people? Who made this? 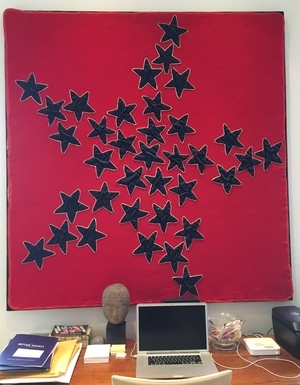 Tell me about this "Star of Stars" quilt. It's so wonderful and so different from any other quilt I have. It's a star made up of stars. There's the implication that it has an American theme because it's red, white and blue. Then you get in closer, and you find there's quilting of dozens of other stars that's just in the red background. It feels modern, but I don't think it is modern. I think it may be at least 75 or 100 years old. Is a documentary on quilts in the offing? These quilts have their own secrets, and I'm not sure how you can join them together. Sometimes the subject is best left alone.